After many disastrous years spent trying to shape the Middle East, the Obama administration has refocused its foreign policy toward defending U.S. interests in economically wealthy East Asia. President Obama’s “pivot to Asia” is widely perceived as an attempt by the United States to contain China’s growing economic and political clout in that region. But the resulting increase in U.S. pressure on China’s eastern periphery has had an interesting side-effect — it has led China to look elsewhere on the continent for opportunities to trade, invest, and build diplomatic influence. A major target of this redirected effort has been China’s neighbor to its west, Pakistan. A series of joint Chinese-Pakistani infrastructure projects are now underway, branded collectively as the China-Pakistan Economic Corridor (CPEC). These investments are intended to build Pakistan’s economic capacity and increase its links to western China, while giving China access to port facilities on the Indian Ocean. Although the project could have significant long-term economic benefits to the region, it has engendered tensions with India, which has had contentious relations with both China and Pakistan in the past. How China navigates this effort to expand its influence with Pakistan, and how other powerful countries respond, could determine whether South and Central Asia embark on a new era of shared prosperity or remain trapped in a cycle of conflict. Pakistani President Mamnoon Hussain, left, meets with Chinese Premier Li Keqiang, right, in Beijing, China, on Feb. 20, 2014, while visiting to bolster bilateral ties including agreements on economy and trade. During a state visit to Pakistan in 2015, Chinese President Xi Jinping signed a series of high-profile agreements for Chinese companies to construct roughly $46 billion worth of highways, ports, and energy infrastructure in Pakistan. The projects are related to a larger Chinese effort to expand its economic and political influence in Asia, known as the Silk Road Economic Initiative. The massive investment in Pakistan is also seen as providing an economic anchor to the longstanding military and political relationship between the two countries. Speaking to the Pakistani parliament during that visit, Xi highlighted a history of traumatic events that brought the two countries together over the latter half of the 20th century. “Both China and Pakistan suffered from imperialist and colonialist aggression and oppression and we extended mutual sympathy and support to each other,” he said. “We will never forget that Pakistan was one of the first countries to recognize New China and the first Islamic country to enter into diplomatic relations with China.” He noted that in its early years, Pakistan helped the nascent People’s Republic of China circumvent a blockade by foreign powers and claim a seat at the United Nations. Pakistani politicians have promised that the billions of dollars in Chinese infrastructure projects will be a “game changer” for Pakistan’s economy after years of instability. But the huge political capital invested in the projects has also bred fears that the projects will be undermined by Pakistan’s strategic rivals. The Pakistani military — whose leaders are often unhealthily fixated on India even during calm times — have repeatedly claimed that Indian intelligence agents and their proxies are fomenting attacks aimed at sabotaging CPEC projects. Modi’s speech was widely viewed in Pakistan as a threat to undermine CPEC. It was also viewed with alarm in China, where the CPEC investments are seen as both an economic opportunity and a means of stabilizing Pakistan, a neighbor that has teetered uncomfortably close to the brink of chaos over the past decade. Terrorist attacks in Pakistan have dropped over the past two years following the launch of a major military campaign in the tribal regions, but the country remains beset by a number of serious challenges to its long-term stability and prosperity. China’s investment is viewed as a means of shoring up Pakistan’s economy, creating a new market for its own excess production, and reducing Chinese dependence on other trade routes in Southeast Asia, particularly the Strait of Malacca. Small is the author of The China-Pakistan Axis, a 2015 book analyzing the strategic relationship between the two countries that has developed over the past several decades. Historically, this relationship has been anchored in military and political cooperation at the elite level. Pakistani diplomats famously helped engineer China’s rapprochement with the United States during the Nixon era, while China has long been a source of military hardware and intelligence cooperation for the Pakistani armed forces. 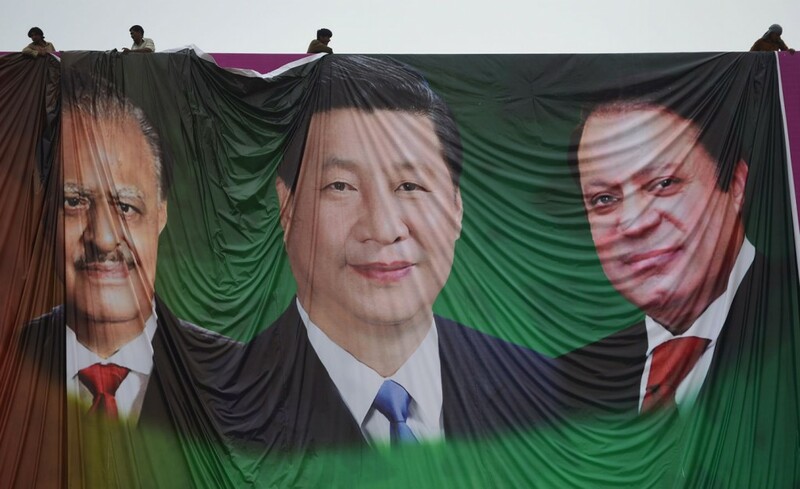 Pakistani workers arrange a welcoming billboard featuring pictures of visiting Chinese President Xi Jinping, center, his Pakistani counterpart, Mamnoon Hussain, left, and Prime Minister Nawaz Sharif, right, in Islamabad, Pakistan, on April 18, 2015. The CPEC project is thus envisioned as a kind of Marshall Plan for Pakistan’s economy. It is estimated that power shortages drain as much as 2 percent of Pakistan’s GDP annually, while a lack of infrastructure prevents local industries from developing to their full capacity. CPEC would address these shortcomings with energy projects, highways, and the development of a major port facility in the Indian Ocean town of Gwadar. For China, CPEC is also an answer to American efforts to box out its economic influence in East Asia. Earlier this year, Obama signed the Trans-Pacific Partnership, a trade agreement intended to solidify the United States as the key economic player in East Asia. Naval tensions have also increased in the South China Sea, where U.S. allies are engaged in a series of long-running territorial disputes with China. But despite seeking to contain Chinese influence in East Asia, the United States has taken a generally benign view of the CPEC project. Some in the U.S. see the project as a means of helping stabilize Pakistan, a nuclear-armed country that spent the past decade wracked by a domestic insurgency. With an overwhelmingly young population of nearly 200 million people, Pakistan is the sixth biggest country in the world by population. Generating stability in Pakistan through economic growth could be a win-win for an American administration whose own relationship with Pakistan has soured — and that is otherwise wary of seeing its allies courted by a regional rival like China. Views differ in India, however. Modi’s hostility toward the China-Pakistan Economic Corridor represents a school of thinking in Indian foreign policy circles that sees an economically revitalized Pakistan connected to China as a potential threat. Sensitive about foreign interference in India’s own restive province of Kashmir, India’s suspicious view of the project seems to reflect historic fears of strategic coordination by hostile neighbors. But analysts say there is little to indicate that CPEC is rooted in such a strategy. Instead of starting a new era of conflict, the economic integration of the region could actually help close the chapter on its troubled post-colonial history. If it succeeds in modernizing Pakistan’s infrastructure and boosting its economic output, CPEC could transform Pakistan from a threat to India into a robust trading partner.